Pain? Headache? Chronic pain? Tension? Backache? Muscle ache? Migraine? Stomach ache? There are different types of pain. Pain is generally a signal that something somewhere is not right. But is this always the case? What about chronic pain? Pain can have a large influence on your daily life. It can stop you from functioning properly. If there is no clear medical cause to the pain, it is useful tot treat the pain in a different way. In that case, pain usually does not point at a disruption in your body, but rather has a cause somewhere else. These types of pain are usually more difficult to treat, but there generally are ways of treating or eliminating this pain. Read more here about the treatment of pain and which types of pain there are. You can also take the free pain test, which tells you more about the type of pain which you experience. As mentioned earlier, pain has the goal of warning you that something is not right in your body. Pain thus has the goal of helping you to treat this issue with you body. It furthermore wants to warn you that something is not good for your body, such as landing flat on your stomach when jumping in the swimming pool. Pain is not experienced in the same way by everyone. For example, it can be so that pain lasts longer for some people, but that does not mean that the pain expresses itself in the same way in these people. Furthermore, there are different causes and personal experiences which make pain worse. On top of this, the degree of pain makes a lot of difference. This namely helps decide to what extent your pain disrupts your daily life. The same type of pain can express itself differently in different people. An example of this is migraine, which differs from person to person. Your pain threshold can also cause a different experience. Or, for example, the way in which you deal with pain can have an immense effect. Taking one’s mind off of the pain is a good technique to reduce the pain. You namely often experience the pain to be worse when you focus on it. This approach to pain is called the biopsychosocial model. This model integrates different factors and determinants of pain. Social, psychological, as well as physical factors namely decide the severity of the pain. Regardless of the cause of the pain, the factors above are thus mapped. This is because the reason for the pain can sometimes be the same in two different people, while it does not have the same influence on the lives of these two persons. For example, a more serious treatment might be prescribed for someone who suffers more in their daily life. What about the causes of the pain? There can be different causes of pain. For example, a physical issue might occur which causes you to feel pain in that body part or somewhere else. It is not always so that pain has a physical cause. SOmetimes pain can also be caused by psychological factors. it is useful to first always ask a doctor or professional to check the type of pain you are suffering. It is namely useful to first rule out physical causes in order to learn more about alternative treatments. Physical causes are best treated by doctors, but other causes might require a different approach. You will notice that, on top of this, a medical treatment will not help a lot in psychological factors. In order to guarantee the type and effectiveness of a treatment, it thus is useful to look at the cause of your pain. Physical causes of pain can point at different types of disruptions in the body. For example, pain because of a damaged nerve feels different from pain due to a blood vessel disease. These types of pain can also occur simultaneously. Your doctor or specialist can tell you more about this. Nociceptive pain. This is pain which is caused by tissue damage, for example when you sprain your ankle. Visceral pain. This pain occurs, for example, in case of intestinal inflammation. Neuropathological pain. This pain can be caused by a damaged nerve, for example. Vascular pain. This pain has to do with the blood vessels. Thus it can be caused by, for example, an illness located in these. Oncological pain. This pain has to do with, for example, the growth of a tumor. Psychological factors, too, can cause pain, even physical pain. For example, stress can lead to headache or muscle ache. Our mind and emotions can cause hormonal imbalances. Furthermore, long-term pressure on the mind can have severe physical and psychological consequences. It thus is not always so that physical pain has physical causes. Psychological causes can have an influence on a broad number of complaints. You should not underestimate the influence which your mind and emotions have on pain and how you can use this, either to reduce your pain or to make your pain more severe. At the bottom of this page you can read how you can use your mind in order to eliminate psychological factors of pain and even how you can reduce pain which is caused by physical causes. The causes of pain mentioned above can occur acutely or chronically. Acute pain is pain which occurs right after the incident takes place. This pain may be present up until 3 months after the injury. After that, it is considered to be chronic pain. Both acute and chronic pain can have severe consequences. Oftentimes, people – especially those who suffer from chronic pain – are looking for the cause of the pain for a long time. You can thus really suffer from experiencing daily pain. In its turn, this can have psychological consequences. For example, people with chronic pain often suffer from depressed feelings. Headache can severely influence our daily lives. There are different types of headaches, ranging from very light to very severe. The intensity, frequency, and the causes of the headache can differ a lot between headaches, both interpersonally as well as intrapersonally. You can experience a tendency of certain headaches occurring, but then suddenly experience another type of headache. In many cases, headache also occurs as a consequence of a combination of different factors. Headaches can take many different shapes and forms. For example, one can experience a throbbing or pounding headache. Headaches can occur at one side of the head or at both sides. Furthermore, headache can situate itself in the front or the back of the head. Because all these different types of headaches exist, it is logical that they do not all have the same causes, nor that they all require the same type of treatment. Tension headache. This type of headache is caused by muscle tension, often caused by stress. Migraine. This type of headache seems to occur rather commonly and can have different causes. Cluster headache. This type of headache manifests itself at the hand of a certain pattern, which comes up periodically. Sinus headache. This headache causes a throbbing feeling at the front of the head, and often precedes a sinus infection. “15Minutes4Me.com” was developed by doctors and psychologists and has the goal of daily supporting people with different types of headaches at the hand of the online self-help program. The program contains therapeutic techniques, which help you to eliminate psychological causes, and to learn to better handle physical causes. Would you like to know more about which causes are at play in your headache? Then take the free stress induced pain test here. Psychosomatic complaints are a combination of physical vulnerability, enhanced by psychological triggers. In the case of psychosomatic complaints, we speak of physical complaints which follow the psychological triggers. If you suffer from psychosomatic complaints, chances are that you have already been to different doctors in order to try to find a concrete cause of your pain, but you have been unable to find this cause as of yet. Is the pain real or are you imagining it? The pain most definitely exists. Oftentimes, people with psychosomatic complaints get to hear that they are imagining their pain. Psychosomatic complaints are acknowledged as a disease and are taken up by the DSM, which is a diagnostic manual. How are psychosomatic complaints expressed? Despite the symptoms being physical, it can be so that these complaints are triggered by stress and emotions. There namely are several stressful situations, such as moving or a divorce, which can take a lot of your energy. Furthermore, the way in which you handle these situations will have a large influence on whether or not psychosomatic complaints are experienced. Because the cause of the complaints is both physical and psychological, it is useful to train your mind and body in such a way that these causes are reduced and, eventually, eliminated. The online self-help program by “15Minutes4Me.com” supports you on a daily basis on this mission. Research has shown that participants experience 70% less stress on average after following the program for a month, stress being a large trigger of psychosomatic complaints. Would you like to know whether psychological factors might form a trigger for your pain? Then take the stress induced pain test here for free! Muscle ache is a type of pain which occurs relatively frequently. Muscle ache is generally caused by a long-term tenseness of the muscles or by too intensive use of these muscles. Muscle ache is often a predecessor of pain which after a while even can lead to headache. Causes of muscle ache and tension? Except for these psychological causes, there also are several physical causes of tension, such as migraine or an intensive work-out. There also are certain physical disorders which can cause tension. Would you like to know whether your tension is caused by physical or psychological factors? Then take our free stress induced pain test here! The pain which you experience in chronic pain, no longer has the protective and warning function which nature intends pain to have. In case of chronic pain, the body is often weaker and more vulnerable to experiencing pain. Your body therefore notifies you of more pain than there actually is, or more easily attributes pain to situations where pain should not be experienced. Your pain system thus is more sensitive, meaning that pain is more easily and more severely experienced. Chronic pain can make it so that there are certain things which you can no longer do. Oftentimes, people must sit or lie down for extended periods of time because they experience too much pain. This can have severe psychological consequences. Often, people suffer from isolation and depression because of their experience of long-term pain. Learning to deal with chronic pain? There are several tips and tricks when it comes to learning to handle chronic pain. Unfortunately, there is no specific treatment yet, which helps patients with eliminating chronic pain. That is why they often are told that they have to find ways in order to deal with the pain in a better way. First of all, it is useful to let your pain inhibit you as little as possible. Know that the pain is no indication of anything being wrong. Try therefore to do as much as you can, in order to combat depression and to keep your body going. Next, distraction is a good idea. When you think less about the pain, it is generally experienced less. This way, the pain also has less influence on your psychological functioning. Would you like more tips about how to handle chronic pain, or are you looking for support for people with chronic pain? Then you can always read more about the therapeutic online self-help program by “15Minutes4Me.com”. Tension can be felt all over your body. In the beginning, it will not do a lot of harm, in the sense of pain or damage. After a while, however, you might start to suffer from tension headaches, aching muscles, … Tension is frequently caused by psychological factors. If stress and other psychological causes lie at the basis of your tension, it is useful to look for a solution for these factors, as this will work more effectively than taking medication every day. Tension can be caused both by psychological causes as well as physical causes. In most cases however, psychological causes are at play. Examples are depression, stress, anxiety, unprocessed emotions,… Everyone goes through some difficult or stressful times every once in a while. For some people, this can have a long-term effect on their body. It therefore is useful to learn to limit these negative effects of stress. This is something which “15Minutes4Me.com” helps you with. The program offers a daily scientific support in order to help you get rid of stress and psychological causes of tension in the long-term. Backache mainly occurs in the older part of the population. Yet, younger people might suffer as well, and 1 in 10 Belgians suffer from backache at some point in their lives. Despite the frequent occurrence of backache, damage of the back or illness are hardly ever the causes of the pain. In very few people, a medical cause can be found for backache. Thus, it often is not so that there is some illness or damage at play, but rather a poor usage of the back in daily movements which can cause the pain. Except for physical causes, there also are several psychological causes of backache. For example, depression and stress can cause pain in the body. When going through a difficult time, pain seems to occur more frequently. This is because our mind makes our body more vulnerable, and also makes it so that we are less inclined to want to move. A treatment for this type of pain can thus consist of checking out the physical causes of backache with the help of a doctor, or following a treatment for the psychological causes of backache. Nowadays, there are scientifically supported programs such as “15Minutes4Me.com”, which can guide you on a daily basis in dealing with the pain. Migraine is a special type of headache, of which about 1 in every 5 Belgians suffers. Migraine differentiates itself from other types of headache, such as tension headaches. Tension headaches are caused by the tension of the muscles, usually those located in the neck. We are not yet sure what the cause of migraine is. Furthermore, migraine can also cause muscle tension, which can intensify migraine. Migraine can have certain physical causes. However, it is not yet certain what these causes entail exactly. There are different theories regarding the development of migraine. Most of these theories consider a disruption of the blood flow. How this is expressed in the brain is something which different parties do not yet agree upon. Except for physical causes, psychological causes also tend to play a large role in the development of migraine. For example, stress often lies at the cause of the development of a migraine attack. It is thus useful to map out these psychological factors and to treat them. Migraine treatment can be done at the hand of different methods. First off, there are different specialists which are allowed to diagnose migraine. This can help you to look for suitable treatment. However, if migraine is not the issue, treatment for migraine is likely to have but little effect. This specialist can then propose a treatment at the hand of medication and similar methods. However, it is also very important to consider and treat psychological causes of migraine. “15Minutes4Me.com” has developed an online program which offers a scientific treatment of the psychological causes. Learn, at the hand of the program, to reduce attacks and to increase your resilience! Stomach ache, too, is a difficult type of pain. Stomach ache is generally caused by damage to the stomach wall or by a disruption in the digestion of the food. What are the possible causes of stomach ache? Not only physical factors can cause stomach ache, however. Depression and stress, too, can be harmful for the stomach. Have you ever noticed that you suffer more from stomach complaints and diarrhea during stressful times? This is caused by excessive production of cortisol which occurs when one experiences stress. It thus is useful to take psychological causes of stomach ache into consideration when looking for treatment. As mentioned earlier, it is useful to look at possible causes of pain. When it comes to physical pain, medicinal treatment can eventually help you. If psychological factors are at play, therapy might be of use. Furthermore, many physical illnesses are caused by a combination of physical and psychological causes. It can thus be useful to follow both types of treatment, in order to increase their effectiveness and rid yourself of the pain more quickly. “15Minutes4Me.com” is an online self-help program which was developed by doctors and psychologists to help guide people with all types of pain and causes. At the hand of therapeutic techniques the program can, for example, help you to reduce your vulnerability and increase your pain threshold. On top of that, at the hand of the techniques you can more easily recognize alarm signals and make time for rest when necessary. 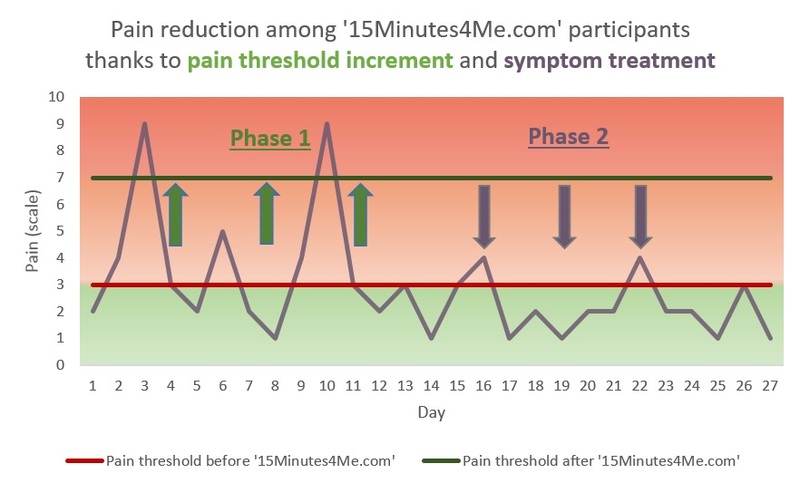 The techniques in the program by “15Minutes4Me.com” can thus help you to reduce and/or eliminate your pain by working on the different causes of pain. Furthermore, you learn to recognize warning signals, so that you can work on the frequency, duration, and intensity of the pain. Finally, you will learn techniques which you can work with after the program finishes in order to prevent relapse. Learn today what you can do about pain and how you can live a more balanced life with less pain! Would you like to test which factors cause your pain and how we can help you? Then take the free stress induced pain test here and discover which type of treatment is best for you.